Just wondering if we're going to have to wait for 16.7 to be able to use HardenedBSD and if that will be based on 11-current or if there is something available now, based on 10.2? Re: 16.1 on HardenedBSD 10.2? There are two tracks to HardenedBSD that surfaced due to different goals and workloads of both projects. The ultimate goal is to get both projects under the same hood some time in the FreeBSD 11 series, or at least get a good portion of HardenedBSD patches back to FreeBSD. If that's 2016 or 2017 is unknown. There are too many factors. As OPNsense, we've asked HardenedBSD to provide a 10.2-RELEASE version of their patches. The ABI-compatible patches of HardenedBSD will be incorporated into 16.1.x as we get to test them and also know that 16.1's vanilla 10.2 works as expected. For HardenedBSD, the goal is to go straight for 11-CURRENT, mostly for driver reasons (OPNsense can't offer that on a stable FreeBSD release), but also because we'd not really need duplicated efforts on 10.2 and because they shouldn't work on enhancing older FreeBSD versions. That being said, Shawn was going to work on a 16.1-based version of HardenedBSD/OPNsense as soon as 16.1 is out, likely based on 11-CURRENT. Shawn, please correct me if I'm wrong. The problem with 11-CURRENT is that it can break too easily and with all the different configs out there, you can't be sure that a specific snapshot doesn't break something for someone. I'm happy with backported patches in base. FreeBSD / HardenedBSD 10-STABLE is great to use. However, there are certain enhancements from FreeBSD 11-CURRENT (which HardenedBSD syncs from every six hours) that I myself need (mainly, the updates to the ath(4) driver). Though I publish these builds for others to use, they're primarily for my own usage. I just publish them in the hope that others find them useful. So, I will be basing my OPNSense + HardenedBSD builds based on 11-CURRENT (and, when 11.0 comes out, 11-STABLE). The biggest problem is the changes to the 802.11 stack that remove the raw wireless devices from ifconfig output. That throws a wrench into OPNSense (and I'll assume pfSense as well, though since I have no way to produce my own builds, I can't verify). I'm very slowly working to resolve that issue. My next builds will be published regardless of the status of the fix. My time is extremely limited these days. I'm holding off doing new builds until 16.1 is published. Once that's published, I need to forward-port my custom patches to our forked OPNSense code. I probably won't release any builds until 16.1.1 (it'll probably take around a week after 16.1 is published to finish the forward port). Let me know if you have any questions, comments, or concerns. It all makes sense. I'm considering running the HardenedBSD flavour of FreeBSD 10 for servers, once we migrate from 9. We'll be testing if it works well with gcc5 first. And regarding OPNsense, we'll wait a bit then for the fork (OPNsense on HardenedBSD) to stabilise to be able to tell the source of problems apart when a service fails. I will play with it in a VM. Source of the problems, what are you referring to? Open tickets or other issues? My message wasn't very clear. The fork I was referring to is OPNsense on HardenedBSD. So if Suricata 3 crashes or IPS doesn't even load (like on 15.7.99), it's easier to track down the issue if working on vanilla OPNsense than if it's running on the hardened version. Now I got you, yes, indeed. We've also built "opnsense-bootstrap" to make it possible to switch between different flavours more easily in the future as it can cope with incompatibilities in OS and packages. It already works well on FreeBSD transforming it into OPNsense. It will also be used to move to the HardenedBSD flavour in the future. 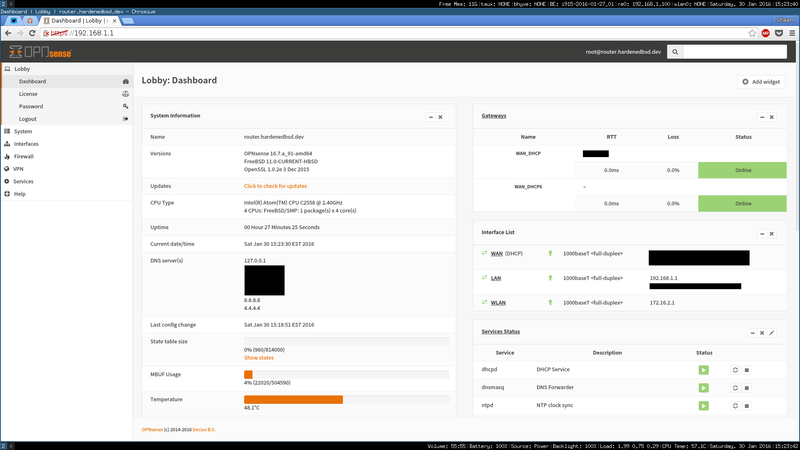 It's official: I've started work on the HardenedBSD + OPNSense 16.1. I'll hopefully have a build I myself will test this weekend and push out for general availability by the end of next week. Here's a little teaser. There's a couple things I gotta do to cleanup, then I'll update to 16.1.1 when that comes out for OpenSSL SA goodness. Then I'll publish the build. 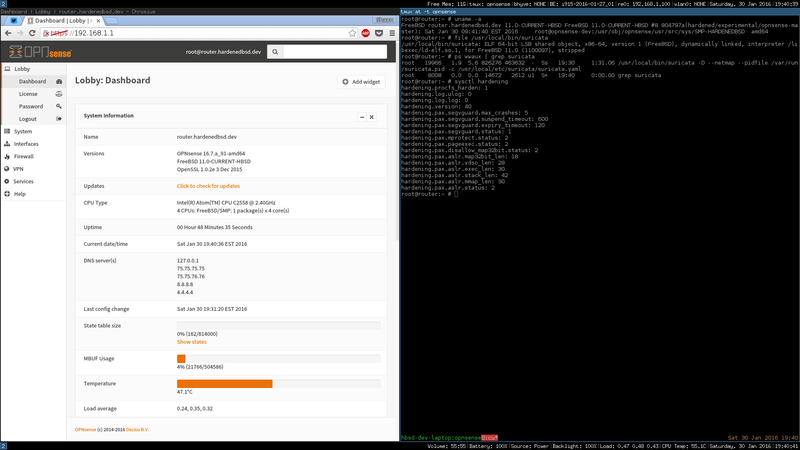 And now Suricata compiled as a PIE and running in IPS mode. It does create RWX mappings, though, so I need to double-check why. It doesn't on my HardenedBSD development laptop.